Giga Metals aims to be a premier supplier of the battery metals that will be needed as the world progresses to a future powered by clean energy. The Company is currently focused on two of the key metals used in the batteries of electric vehicles: Nickel and Cobalt. Less than 25% of the nickel prospective geology has been drilled to date. Engineering studies are underway. The goal is to have the project shovel ready by 2021. 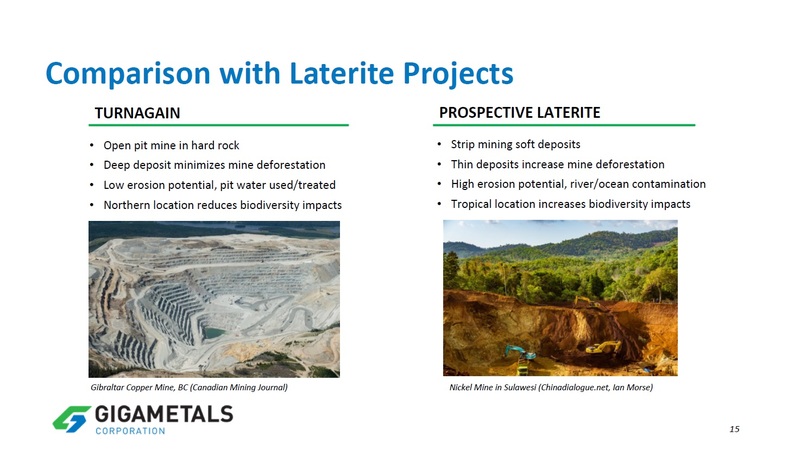 Extensive metallurgical work indicates a clean concentrate grading 18% nickel and 1% cobalt is achievable using proven simple and reliable “off-the-shelf” processing technology. Turnagain concentrate is expected to easily meet the stringent requirements for refining into Class I nickel (purity > 99.98%), which is required by battery manufacturers. 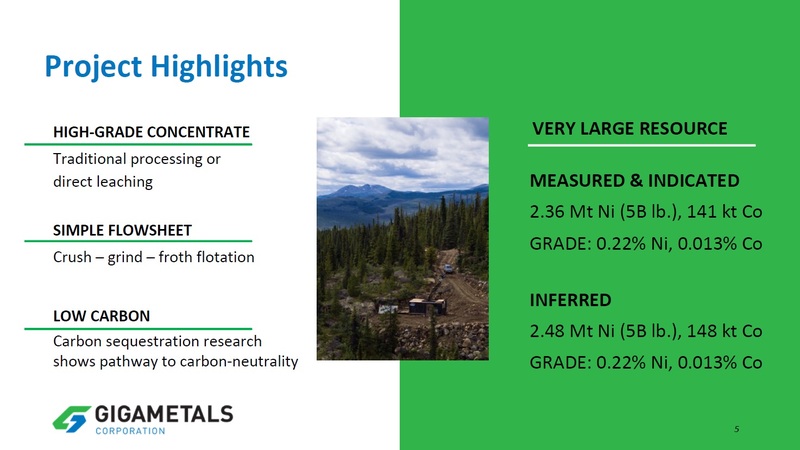 Giga Metals recently sold a 2% NSR on future cobalt and nickel production at the Turnagain Project to Cobalt 27 Capital Corp. (TSX.V:KBLT) for US$1 million in cash and 1,125,000 shares of KBLT. Delineation drilling at the Horsetrail Deposit designed to upgrade NI 43-101 Inferred Resources to Measured or Indicated Resources, enabling engineering studies to be advanced to pre-feasibility and then to the feasibility stage. Infill drilling within the starter pits to collect metallurgical samples and give more definition for more selective mining. The Company's geologists have yet to identify the roots of the ultramafic magmatic intrusive complex that hosts the Horsetrail deposit. In addition, the Attic Zone hosts possible high impact Copper and PGE targets. 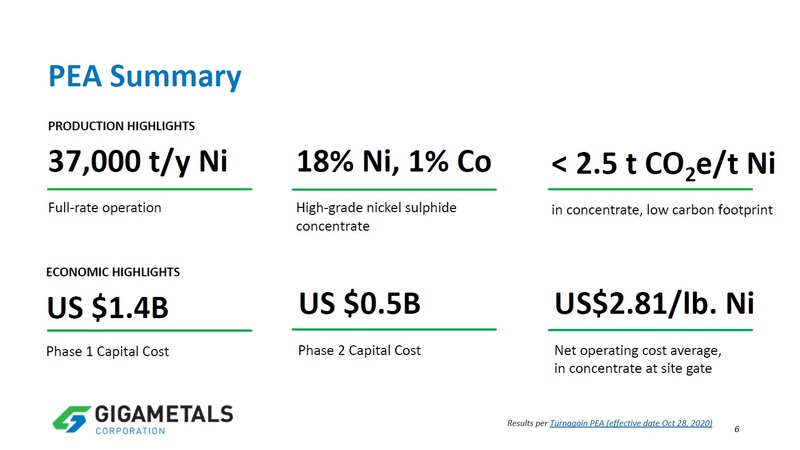 Giant resource offers strong leverage to nickel and cobalt prices. Small market capitalization – lots of room to be rerated in rising commodity cycle. Copper, Platinum, Palladium targets in the Attic zone. Less than 25% of the nickel prospective geology has been drilled. Magnetic targets could be the roots of the system – possible high grade. Strong Management team with deep experience in minerals business. Well connected with capital markets. Advance the project to feasibility. Goal to be shovel ready by 2021. Turnagain is one of the largest undeveloped sulphide nickel-cobalt resources in the world. Sulphide nickel ore is most suitable to be refined into Class I nickel required by battery manufacturers. Cobalt from stable supply jurisdictions will be preferred over Democratic Republic of Congo (currently 65% of supply). Mr. Jarvis has more than 30 years of experience in exploration and development of oil and gas and metals. After a career in financing exploration projects as a stockbroker, he moved to the corporate side of the business in 1996. He joined the board of Ultra Petroleum, which at the time had a large, unconventional gas prospect that ultimately became 3 Tcf of proved reserves. Mr. Anderson has extensive experience in financial and accounting related functions based on his experience working with companies such as Claren Energy Corp., I-Minerals Inc. and Callinex Mines Inc., among others. Ms. Young's 25-year background in the junior capital markets started with CM Oliver & Company where she served as Executive Secretary. Ms. Young was Corporate Secretary and Office Administrator for Giga Metals' predecessor company. Mr. Tupper has over 32 years of mineral exploration experience. He has experience exploring for uranium, gold, base metals and coal in a wide variety of geological settings in North, Central and South America, as well as Asia. Mr. Hitchins spent twenty years involved in various aspects of mineral exploration. He was district exploration manager for Cyprus Gold in Western Australia. 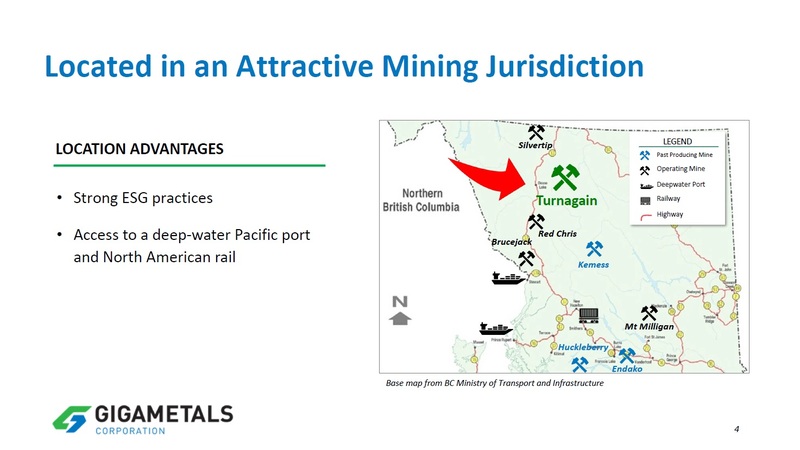 Since returning to Canada Mr. Hitchins has worked with Vancouver based junior exploration companies. Mr. Ross has over 12 years of experience in the mineral exploration and resource development industries. He has served in Project and Senior Geologist roles for junior mining companies operating in Western Canada. Mr. Beswick has over 30 years of experience in environment, permitting and community relations. He was Director of Environment and Permitting for Hillsborough Resources Limited. He is currently a Trustee for the Canadian Institute of Mining Foundation. Mr. Davis is a director and CEO of Condor Resources Inc.
Mr. Robinson is a member of the Investment Team at Pala Investments. He has in-depth knowledge of the electric vehicle and energy storage markets. Mr. Vydra is a former executive with Sherritt International and current Head of Strategy at Cobalt 27 Capital Corp. He will be instrumental in helping Giga Metals select offtake partners. Mr. Morris is a former senior executive with Vale S.A. where his most recent position was Executive Vice President responsible for global sales and marketing of Vale's base metals portfolio including Nickel and Cobalt. 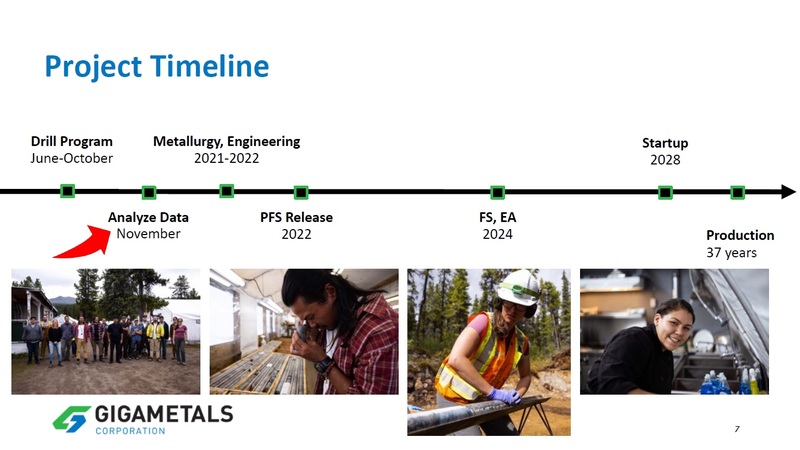 On January 30, 2019, Giga Metals Corp. has released analytical results from 38 of 40 holes drilled in 2018 on the Company's Turnagain nickel/cobalt project. The analytical results reported here further demonstrate the remarkable continuity of mineralization in the Horsetrail and Northwest zones. On January 23, 2019, Giga Metals Corp. announced that it has appointed Robert Morris, a former senior executive with Vale S.A., the largest nickel producer in the world, to the board of directors of Giga Metals. Mr. Morris is a former senior executive with Vale S.A. where his most recent position was Executive Vice President responsible for global sales and marketing of Vale's base metals portfolio including Nickel and Cobalt. 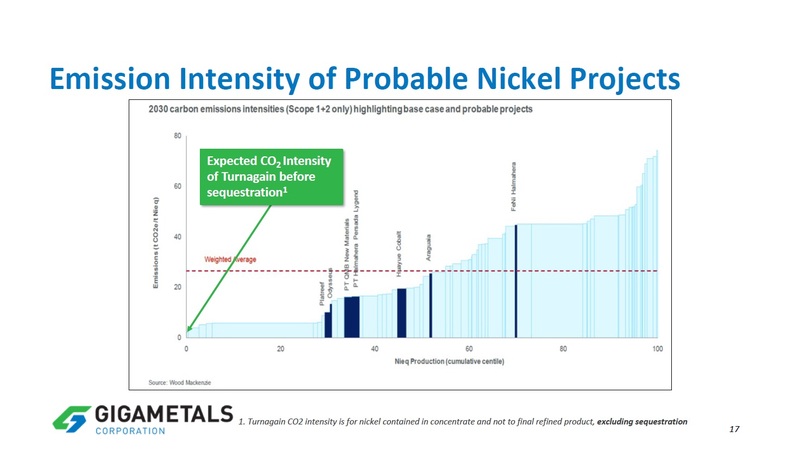 On July 31, 2018, Giga Metals Corporation announced that the Company has closed the sale of a 2% Net Smelter Return ("NSR") royalty on all future nickel and cobalt production from the Turnagain Nickel-Cobalt Project to Cobalt 27 Capital Corp. (TSX.V:KBLT).